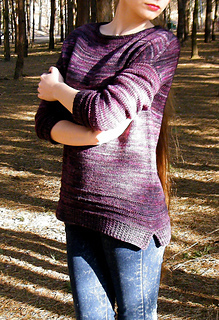 Meimei is a simple, top- down, seamless pullover. Knitting with contiguous method for makes dolman sleeve. Oversize design is comfy and casual. Sizes: XS (S, M) L, XL, XXL. Bust circumference: 40 (44, 47) 51, 54, 56 inches; 100 (110, 117) 127, 135, 140 cm. Choose a size based upon your chest / bust measurement + desired ease (8”/20 cm). This design is intended to be worn with about 8 inches of positive ease. The sample shown is a size S on a 36” bust. Yarn: Malabrigo Rios (210 yd /100g) or any worsted weight yarn that knits up to the required gauge. Needles: circular US #7 / 4.5 mm and US #8 / 5 mm (or as req’d to meet gauge), US#10/ 6mm DPN (for 3-needle bind off). Notions: 5 stitch markers, tapestry needle, waste yarn, stitch holders. Gauge: 18 sts and 26 rows / 4” in stockinette, after blocking, using US#8 needles.